ESET Endpoint Encryption is a simple-to-use encryption application for companies and schools, large and small. Take advantage of the optimised setup that speeds up the time to adoption for admins. The client side requires minimal user interaction, increasing user compliance and the security of your company data. ESET Endpoint Encryption Pro does it all. Full disk and removable media encryption protect laptop computers against the unexpected. File, folder and email encryption allow fully secure collaboration across complex workgroups and team boundaries, with security policy enforced at all endpoints by the Enterprise Server. To discuss your needs regarding data encryption, especially in light of Ofsted recommendations and GDPR, please call Precedence Sales on 08456 446800 or email. Full disk encryption offering transparent pre-boot security using FIPS 140-2 validated, 256 bit AES Encryption. Full remote management, creation and removal of user accounts and user password recovery. Removable media encryption so ESET Endpoint Encryption can protect USB sticks and other removable media with full disk or file level encryption. Full integration with key management system ensures fast, silent operation. ESET Endpoint Encryption Go Portable Encryption is an on-device application which runs straight from the USB stick, needs no install and, with the right password allows the user to edit, read and write encrypted documents on any PC. File and Folder Encrypt only files and folders you want. All files moved to encrypted folder are encrypted immediately. Mail Encryption for transparent email encryption for Outlook through a dedicated plugin. The email can be decrypted only by recipients who share the same key as sender. Text and clipboard encryption works with any e-mail client, including webmail. Text and Clipboard Encryption works with most text-based applications, encrypting and decrypting directly into the active window or via the Windows Clipboard. Virtual Disks and Compressed Archives are ideal for backing up or securely transferring multiple files and folders via any method including CD, DVD and FTP. Encryption Key Management to add or remove any or all encryption keys. Change the encryption policy remotely and silently, without user interaction. Centralised Management for any user or workstation with a standard internet connection. Secure connectivity allows control of endpoint encryption keys, security policy and software features beyond the corporate security boundary. 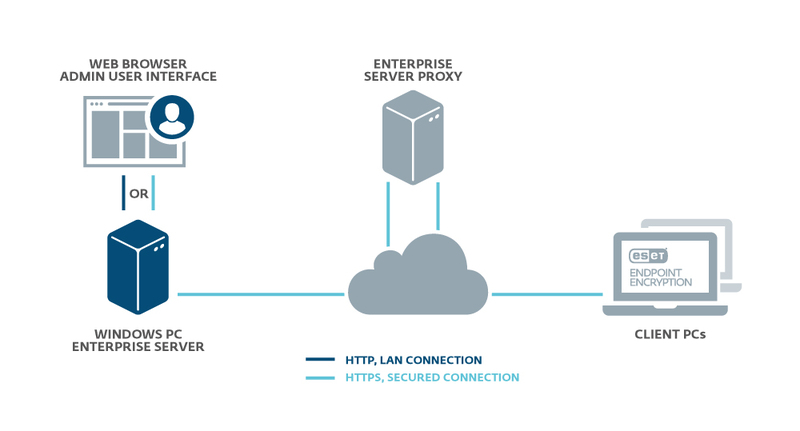 Enterprise Server Proxy as an intermediary, all connections from client and server are outgoing. All information is encrypted with either RSA or AES and the connection itself is SSL encrypted.